1935 | Remains of L.A.
for about two seconds to be cynical and jaded but it didn’t work out. It is probably my favorite place on earth. It is truly, breathtakingly, wonderful. 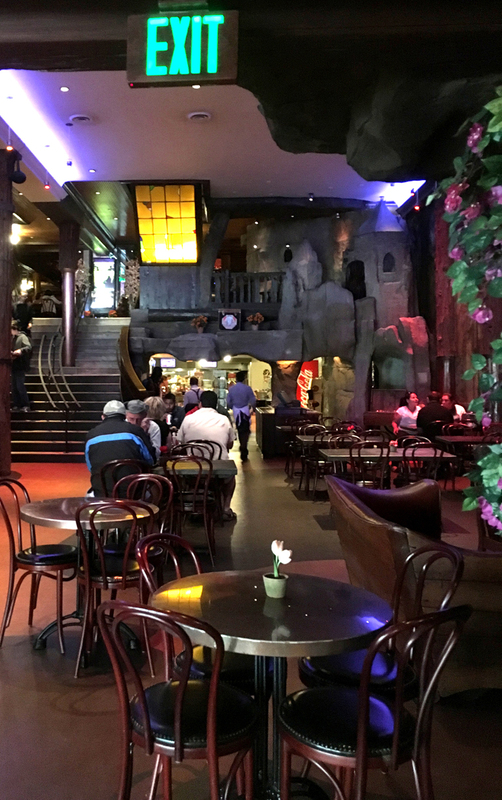 -The first floor has a large eating area, lots of long tables and chairs, with rock walls, pillars like tree trunks, rock archways and a big rock fireplace, a meandering waterfall coming down from the second floor, and forest murals on the walls that aren’t rock. Also lots of flowers. In one corner, almost at the level of the second floor, is what looks like a castle tower carved out of the rock. It is immense and amazing. The cafeteria, which you get to by walking through a gift shop section full of mugs and books and old postcards, is behind the first floor eating area. It’s like a combination of a school cafeteria and a Vegas buffet, with salads and sushi and pizza and meats. Categories: Restaurants | Tags: 1935, dtla, historical L.A., Los Angeles, Restaurants, retro, vintage | Permalink.